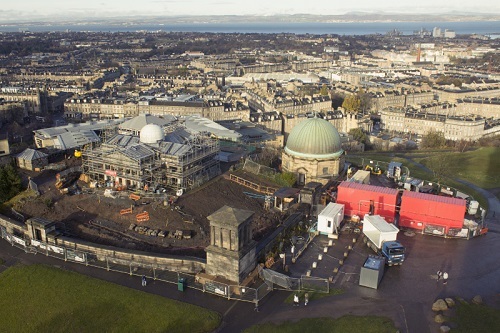 The Collective team is now taking up residence on the City Observatory site before it opens to the public next year. In addition to being re-glazed, the buildings and the roofs are now wind and water-tight. The floor-to-ceiling windows in the new restaurant allow visitors an unparalled view of the city and the Firth of Forth. The traditional lath and plaster applied to the walls and ceiling in the City Observatory and the Transit House is slowly drying out. The restoration of the original stonework has now been completed by a team of apprentices from St Mary’s Cathedral which will allow the scaffolding surrounding the building to be removed in a few weeks time. 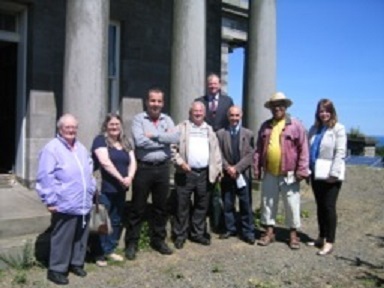 The launch of The Sightseers a new Observers walk created by artist James N Hutchinson with the Lothian Blind Ramblers group and RNIB will take place on 27th October at Collective on the Calton Hill. Inspired by the stories of Thomas Henderson (1789-1844) and Thomas Anderson (1853-1932), both astronomers who made significant discoveries despite having visual impairments, The Sightseers explores what it means to observe when sight isn’t the primary sense and how this could enable us to reimagine or rediscover a place. The Observers Walk was produced through discussion and walks with Lothian Blind Ramblers and recorded live on Calton Hill by actors Eliza Langland and Simon Tait. Refreshments will be provided. The walk will be available to download from Collective’s website on 27 October 2017, we advise that visually impaired people should be guided when doing the walk, members of the team at Collective are trained guides please contact mail@collectivegallery.net to arrange. Observers' Walks is a series of downloadable audio guides commissioned by Collective and created by artists specifically to be listened to on Calton Hill. A discussion and debate marking the launch of two publications: Feminism and Art History Now, edited by Victoria Horne and Lara Perry, and a special issue of Third Text focussing on 'Social Reproduction and Art', edited by Angela Dimitrakaki and Kirsten Lloyd. 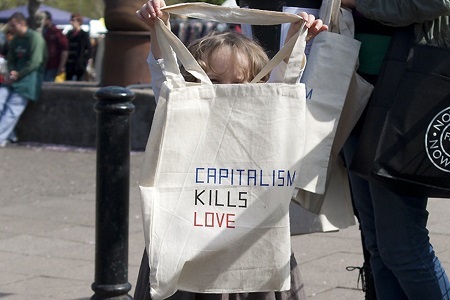 The debate will be held at Edinburgh College of Art, Evolution House, 5th Floor, 8 West Port, Edinburgh EH1 2L on 25 October 2017 from 6—8pm The Social Reproduction of Feminist Art History is co-hosted by Collective and the School of History of Art at The University of Edinburgh. 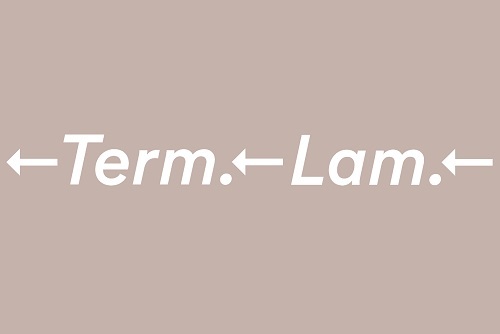 Established in 2017, this research partnership convenes and supports initiatives that centre on art’s intersections with social reproduction and feminist thought. Guillermo Carnero’s ‘A Residence Above the Clouds’ was well received by the audience at the Filmhouse in Lothian Road last Saturday. Dr Bruce Vickery of the Edinburgh Astronomical Society was present at the Scottish premiere. The event to mark World Animal Day at the Omni Centre, Greenside Row, Leith Street on Wednesday was also well attended. Susan Boyle the world famous singer turned up to support the event. Deidre Brock MP, the Councillor for the area gave a very good speech, which was quoted in the ‘Edinburgh Evening News’. A video of the ceremony can be seen on Edinburgh Evening News Facebook. 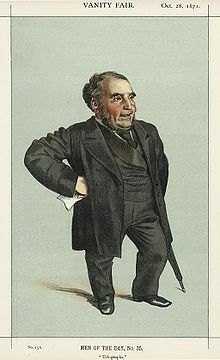 The meal provided by Tony Macaroni’s was excellent. 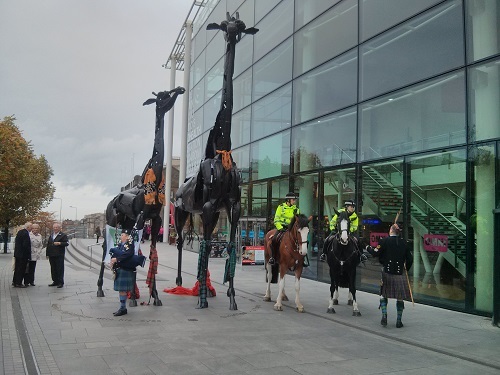 The photograph shows the arrival of the horses from the mounted police who travelled up specially from Ayrshire for the event. Directed by Guillermo Carnero, ‘A Residence Above the Clouds’ tells the story of Professor Charles Piazzi Smyth’s expedition to Tenerife in 1856. The film will be shown during the Edinburgh /Spanish Film Festival at the Filmhouse, Lothian Road at 11.00 am on October 7th. The skies of Edinburgh are too murky to view the heavens. 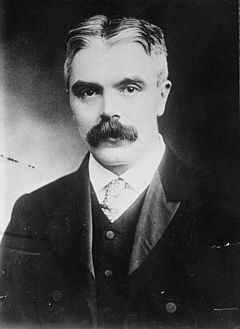 Charles Piazzi Smyth, Astronomer Royal for Scotland, writer, artist and polymath decides to take state of the art telescopes and photographic equipment, carrying them 10,000ft above the clouds of Tenerife. 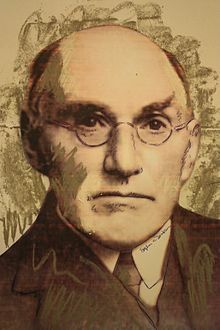 This story of a remarkable man is revealed through eyes of students from the School of Physics and Astronomy (Edinburgh University) and Dr Bruce Vickery of the Edinburgh Astronomical Society. 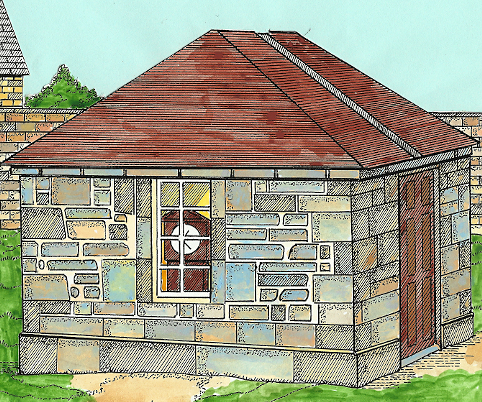 Built in 1814, this building known as the transit house stood on the west side of the observatory compound. The building contained a small transit telescope and a clock. 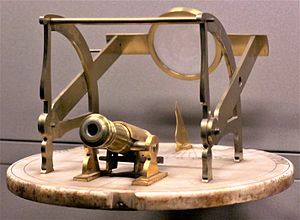 The clock which stood in the window was known as the ‘Politician’s Clock’ as it had a face at the front and a face at the rear, allowing mariners and the people of the town to check their chronometers and watches. Although a large transit telescope was set up in the observatory in 1831, the clock in the window continued to supply the time. Although it was hit by lightning, the clock survived and was sent to James Ritchie & Son to be repaired. The clock was returned to the transit house window in 1869. Deidre Brock MP for Edinburgh and North Leith will be attending the ceremony to mark World Animal Day which will take place at the Giraffe Sculptures, Omni Centre, Greenside Row, Leith Street on Wednesday 4th October at one o’clock. 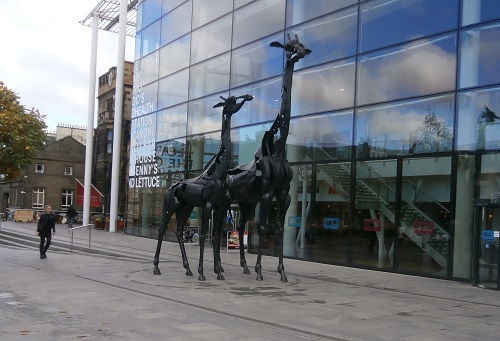 Animal lovers wishing to attend with their pets should gather at the Giraffe Sculptures at 12.45 pm. Music for the event will be provided by a band from South Africa. SS Kronprinz Wilhelm arrived in the Firth of Forth in September 1901. 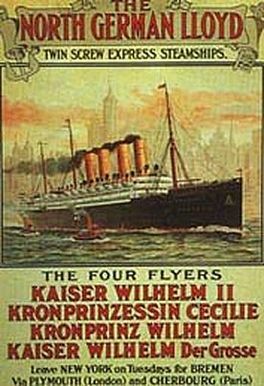 Built for the Norddeutscher Lloyd in 1901, the passenger liner was named after Crown Prince Wilhelm. During the First World War she served as auxiliary warship in the Imperial German Navy before being interned in the United States after running out of supplies. 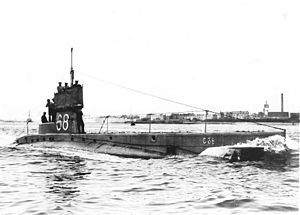 When the U.S. entered the war, she was seized and served as troop transport until she was decommissioned and turned over to the United States Shipping Board, remaining in service until she was scrapped in 1923. Curated by Timothea Armour with new work by Lloyd and Wilson ‘The Last Hour!’ is a new project curated by Timothea Armour that considers the contemporary state, and potential future, of the public house. Taking its title from a chapter of ‘The Pub and the People, a Mass Observation’ study from 1938, which examined the pub as a British institution, ‘The Last Hour!’ seeks to use some of the same research techniques to examine the pub of today. A new newspaper ‘The Last Hour!’ will be distributed to pubs within a mile of Collective, while a series of events will discuss questions around the ownership and role of the pub. In the windows of Collective’s soon-to-be-decommissioned temporary gallery, Toby Lloyd and Andrew Wilson will create a new installation in the form of an expanded mind-map which echoes the appearance of a closed pub. 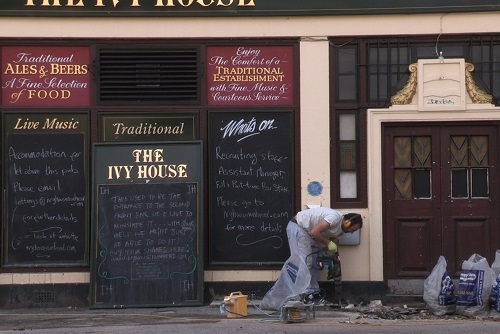 The events programme will culminate with the screening of ‘Public House’ by Sarah Turner, a cinematic portrait of the London pub ‘The Ivy House’, and the local people who saved it from closure and redevelopment into flats. 'The Last Hour' will run at the Collective from 22nd September until November 5th redevelopment into flats. image credit Collective. 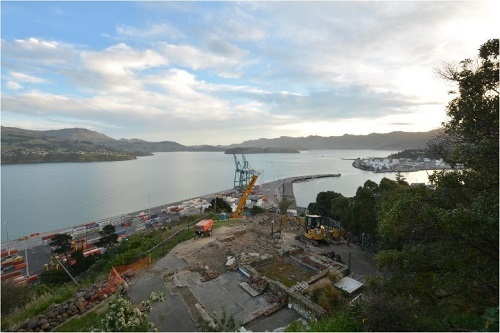 A time lapse camera has been installed at Lyttelton time ball site to record the reconstruction of the Timeball tower. To follow the progress of the $3 million project which began in July, visit this site. Scheduled to be completed by the end of April 2018, the time ball will drop at 1pm each day. Heritage New Zealand and Hawkins Construction are sharing cost of the time lapse camera which records the progress of the project at ten minute intervals from 6.30am to 5.30pm while work is in progress. The project is being supervised by the team at Project Story. 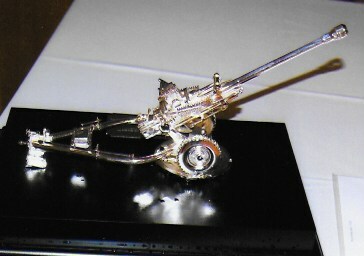 The photograph shows the model of a 105mm Light Gun which was presented to the One o’Clock Gun Asscn by 105 Regt RA Vols to commemorate the 150th anniversary of the One o’ Clock Gun. 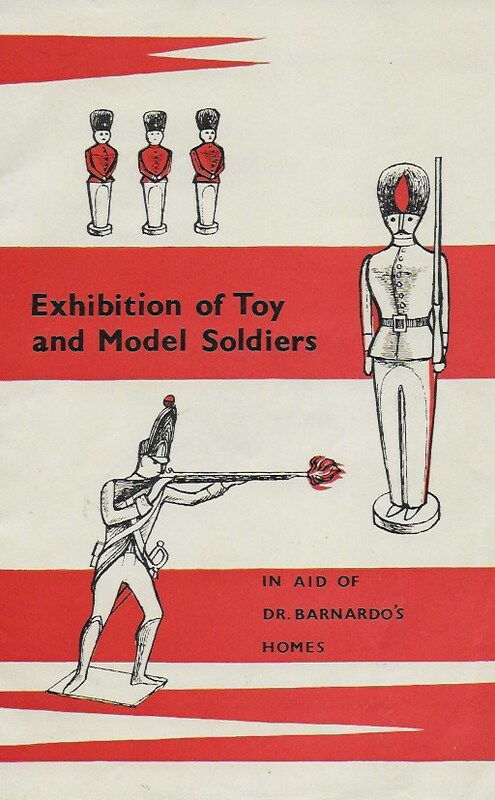 The model was presented to the chairman at Edinburgh Castle by Colonel Huthwaite who commanded the regiment in 2011. 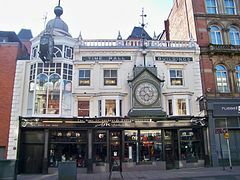 Time Ball Buildings situated in Briggate, Leeds dates from the early 19th century. 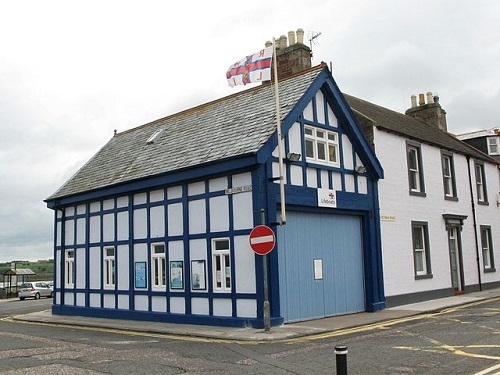 The building contained a distillery, saddlery, stationer and barber and perfumier. By 1869 the premises were unoccupied. 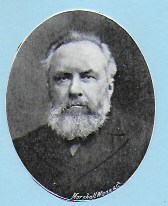 Number 26 was occupied by watchmaker John Dyson in 1872. 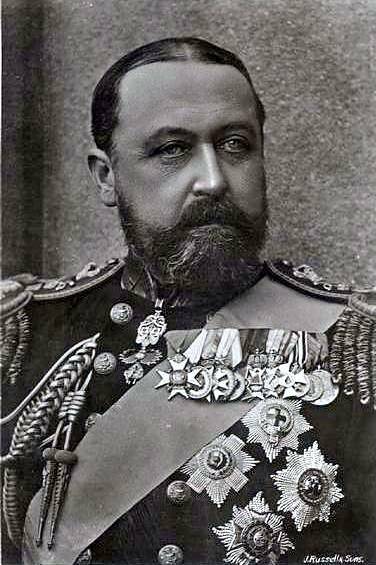 By 1890 he also occupied 24 and 25. The elaborately decorated frontage above 25 and 26 dates from 1872. The building has a gilded time ball and cantilevered clock, surmounted by a figure of Father Time carved by John Wormald Appleyard. A second clock by Potts of Leeds was installed in 1910. Connected to Greenwich, the time ball dropped daily at 1pm. 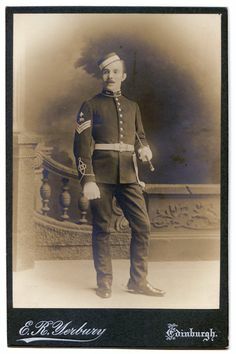 image credit Wikimedia Commons. 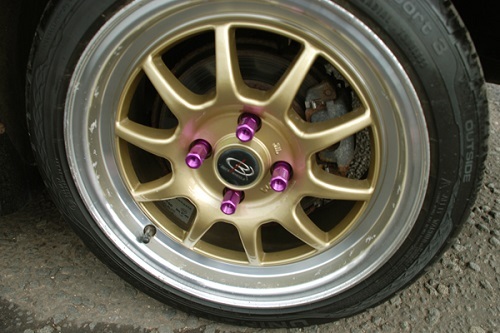 Vintage car enthusiasts have been bringing their vehicles to the Calton Hill since the 1990s. Collective invited innovative artist Clara Ursitti to work with the East of Scotland Car Club on a new one-off performance which focuses on the unique sounds, scent and look of the enthusiasts' vintage vehicles for this year’s Edinburgh Festival. Presented as part of the Festival Art Late, featuring Collective, Edinburgh Printmakers, Rhubaba, and Custom Lane. The gallery will be open from 10 am till 6 pm during the month of August. Erected in 1913 the year following the disaster, the Titanic Memorial is a 60-foot-tall lighthouse which was built partly due to the instigation of Margaret Brown. 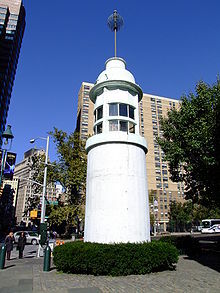 The lighthouse stood above the East River on the roof of the old Seaman’s Church Institute of New York and New Jersey at the corner of South Street and Coenties Slip. 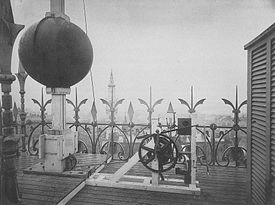 The time ball at the top of the lighthouse dropped at twelve noon, activated by a telegraphic signal from the Naval Observatory in Washington D.C. until 1967. When the Seamen's Church Institute moved to 15 State Street in 1968, the memorial was donated by the Kaiser-Nelson Steel & Salvage Corporation to the South Street Seaport Museum. The memorial was erected at the entrance to the museum complex, on the corner of Fulton and Pearl streets in 1976. The funding was provided by the Exxon Corporation. Born in Hannibal, Missouri, U.S.A. in 1867, Margaret Brown was a socialite and philanthropist. A survivor of the RMS Titanic disaster, she insisted that the crew of Lifeboat No. 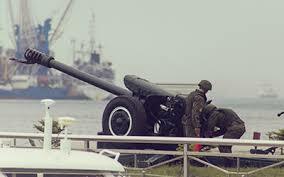 6 return to the area where the passenger liner had gone down to look for survivors. Known to her friends as ‘Maggie’ she was referred to as the ‘Unsinkable Mrs. Brown’ in her obituaries when she died in 1932. 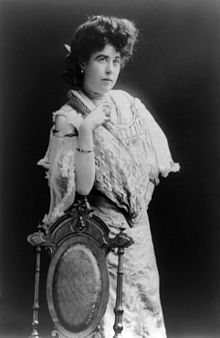 ‘The Unsinkable Molly Brown’ based on her life opened on Broadway in 1960. The film adaptation was released four years later. A new film and installation‘The Heavy of Your Body Parts and The Cool Air of the Air Condition’ by Ross Little, traces the different forms of globalised labour. The film contrasts the experiences of employees working long shifts and the ‘digital nomad’ passengers. Combining luxury travel with online work, are represented in impressionistic, dream-like style. 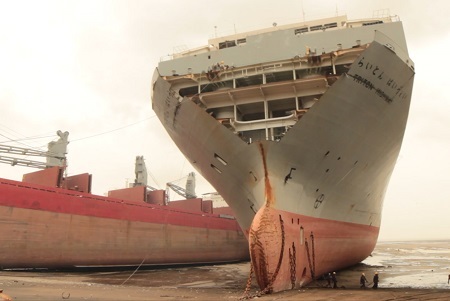 In the ship breaking yards of Alang, India, raw footage documents the decommissioning of a cargo ship and the subsequent journey of the scrap material. Though differing vastly in many respects, notably in their ability to freely speak and represent themselves, all workers in the film share a common status as economic migrants within globalised industries. The film can be seen at the Collective from 22nd July. Dr Bruce Vickery’s illustrated talk ‘Astronomy on Calton Hill’ takes place at 2.30 pm on Saturday, 1st July at the Nelson Monument. The all inclusive ticket costing £5.00 entitles members of the public access to the exhibition in the monument’s gallery plus access to the observation platform. An event not to be missed. Bruce's talk will continue on a weekly basis until the end of August. Lucas Clocks officially opens at noon on Saturday, 1st July. The firm owned by Lucas Marijnissen a highly experienced horologist is situated at 5 Quayside Street, Leith. Further information can be found here. In May 1860, after lying at anchor for fifteen days in St. Margaret’s Hope in the Firth of Forth, the Channel Fleet led by H.M.S. 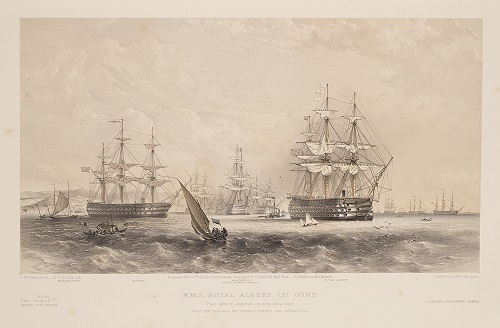 Royal Albert under the command of Rear-Admiral Sir Charles Howe Fremantle sailed down the Firth of Forth in a single line towards the North Sea heading for Yarmouth Roads. The squadron formed into two lines after passing Inchkeith. The fleet was followed by a flotilla of steamers carrying members of the public. 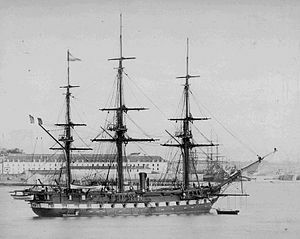 Launched at Woolwich Dockyard in 1854, the three decker was armed with 121 guns. Originally designed as a sailing ship, she was converted to screw propulsion while still under construction. 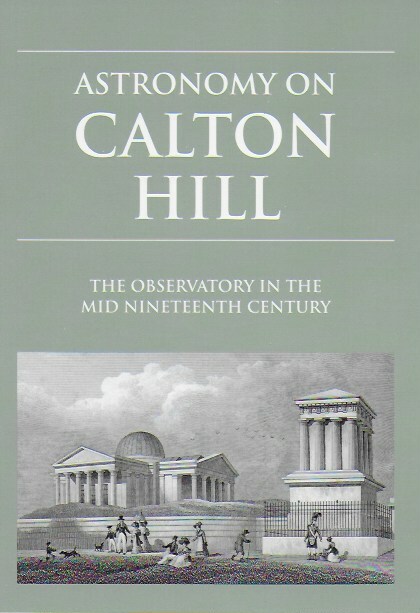 ‘Astronomy on Calton Hill’ featuring the history of the observatory in the mid nineteenth century is now available. Written and meticulously researched by astronomer Dr Bruce Vickery a member of the Astronomical Society of Edinburgh, the fascinating sixteen page fully illustrated booklet is filled with fascinating facts on the scientific instruments and the world class astronomers who worked in the observatory. Price £3.00 plus postage and packing. Enquire here to obtain your copy. 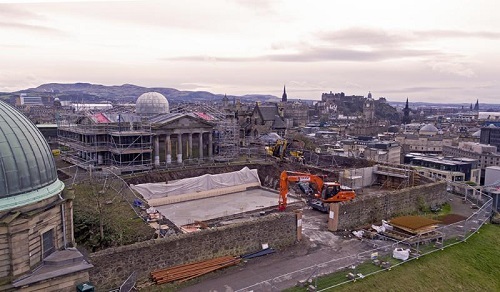 The foundations and walls of the Collective’s gallery, offices and restaurant are now in place, while the restoration of the ceilings and floors of the City Observatory is proceeding as scheduled. The floor joists inside the main building are being repaired prior to the installation of a new oak floor. The original lathe and plaster walls and the ceilings are also being carefully restored. The false ceiling above the transit telescope has been removed, revealing the full length aperture above the transit telescope. image credit Collective. 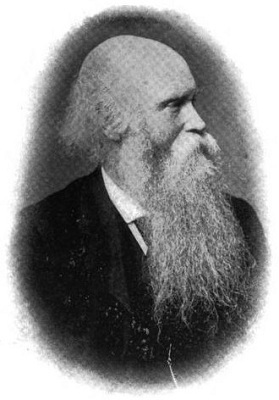 John Pringle Nichol was a leading figure in the Astronomical Institution of Glasgow. The institution was responsible for raising funds for the erection of a new observatory at Horselethill in the West End in 1841. 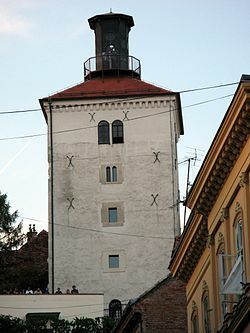 Appointed Observer, the astronomer and his family moved into a house attached to the observatory. 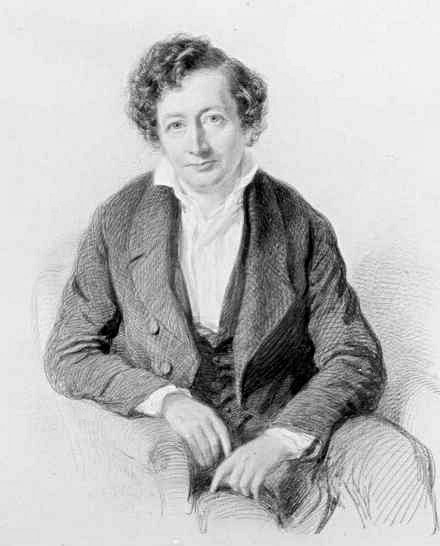 Although Professor Thomas Henderson the Astronomer Royal for Scotland tried to advise the astronomer on financial matters, his advice was ignored leading to the institution running into difficulties. We have been reunited with our original website which is http://1oclockgun.org. We will be moving everything from http://piazzi.uk to this site but will leave both running in parallel for a short while so that the search engines can adjust to the new arrangements. Edinburgh’s Church on the Run! An exhibition covering the history of the Trinity College Church, is currently running at the Central Library, George IV Bridge. 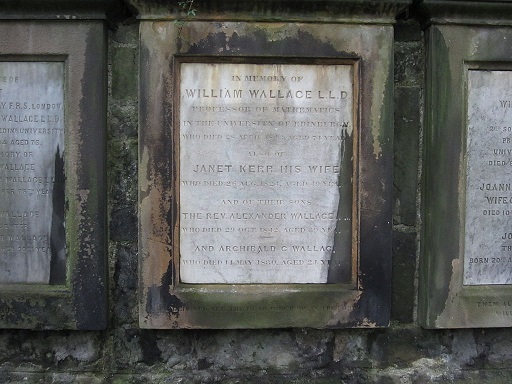 Consisting of prints from the library’s collection, including 18th century engravings, 19th century photographs and watercolour paintings, the exhibition looks at the creation, destruction and partial survival of this important medieval church which was demolished to make way for the Waverley Station. Alex Impey’s innovative art presentations consist of sculptural installation and text, which speculate on the production and organisation of value. Stretching across the gallery walls, the sculptural installation takes on a mirrored form. Using materials, ranging from car air ducts to chitin, a natural material derived from crab shells which produce particular resonances, the presentation reflects the engineering practices used by animals and the processes utilised by humankind to make sense of the world. 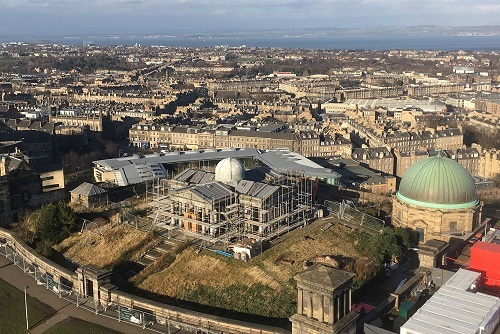 Restoration work at the Calton Hill observatory project is proceeding to plan. The foundations for a new gallery and restaurant have been laid. 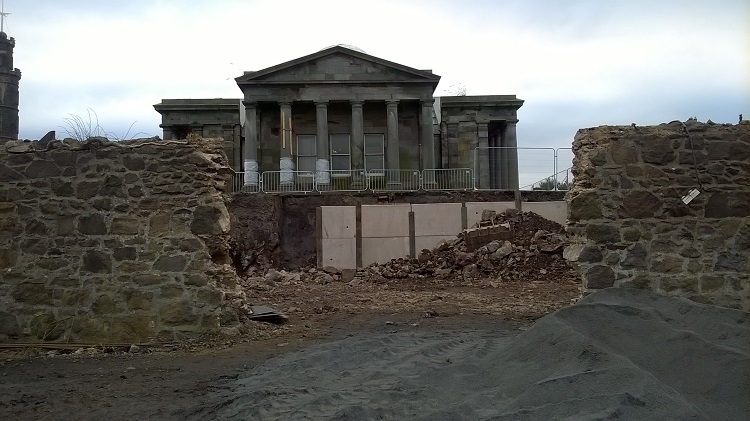 Several interior dividing walls which were added at a later date have been removed in order to restore the building to it’s original layout. The roof of the Transit House has been stripped, revealing a timber frame construction underneath. To read more about the progress and Collective's vision for a new kind of City Observatory, click here. 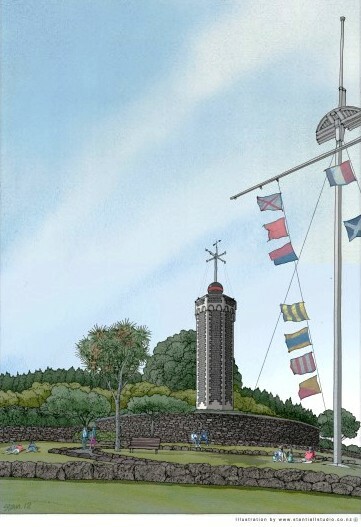 When the new Royal Observatory moved from the Calton Hill to the Blackford Hill, Professor Copeland was still required to supply the signal for the time ball, the time gun on the Half Moon Battery, the naval dockyard clock at Rosyth, the clocks at the University, the General Post Office and the Dundee time gun which meant that the difference in longitude between the two observatories had to be determined. 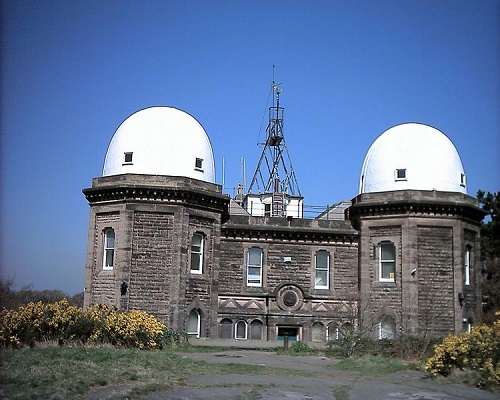 The new location was found to be 1.17 seconds west of the observatory on the Calton Hill. 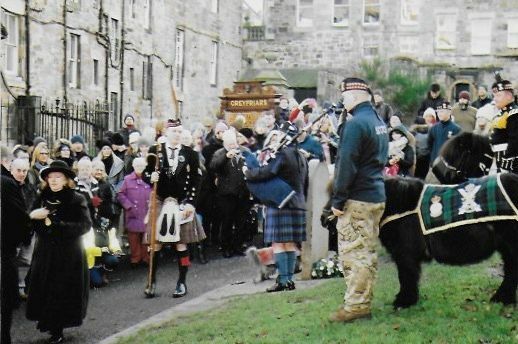 Greyfriars Bobby Commemoration Day takes place on Saturday 14th January. 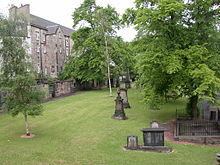 Edinburgh was at the forefront in the development of printing, engineering, brewing and medicine when Bobby first appeared in Greyfriars Kirkyard. 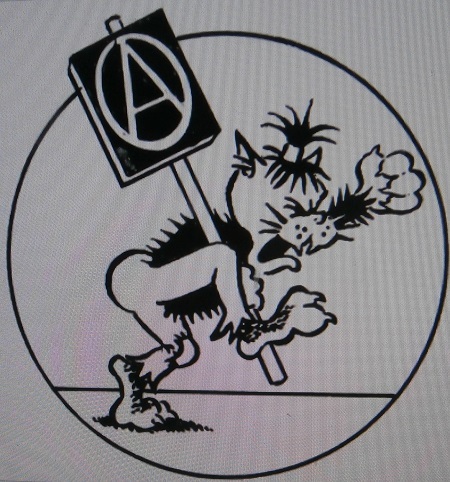 Bobby’s arrival coincided with a proposed an urban renewal project which would bring an end to the city’s overcrowded and unsanitary housing conditions. The Improvement Act of 1867 led to the ancient tenements being demolished and new buildings erected in the centre of the city. The Lord Provost William Chambers also presented the wee dog with a licence and a brand new collar. For details of Saturday’s event check out here (opens a new tab in your browser). 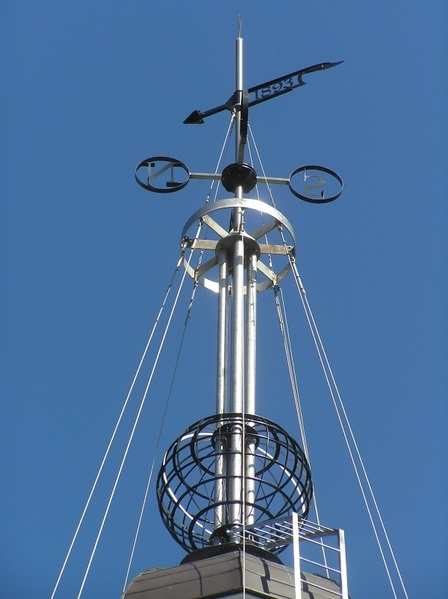 Dr. Roger Kinns has completed his paper on the principal time balls set up in New Zealand. Last November Roger travelled to New Zealand to compile notes on the country’s time signals in the public libraries of Auckland and Christchurch. Accurate time signals were essential for navigation in the Pacific. The time ball service at Wellington began in March 1864. 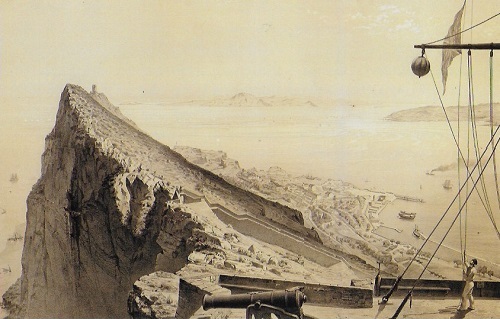 Although the time balls at Wellington and Lyttelton were included in the 1880 Admiralty list of time signals, Otago being added later, due to a long period of docks redevelopment, the service at Wellington was suspended until it was resumed at a different harbour location in 1888. 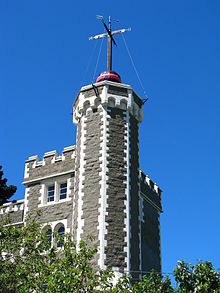 The photograph shows the Lyttelton time ball station which was destroyed during an earthquake which occurred in the Christchurch region in 2011. image credit Wikimedia Commons.